If you were intrigued by the Pebble Time smartwatch but weren’t crazy about its looks, you can now order a Steel version for $70 more. The Pebble Time Steel trades plastic for stainless steel in black, silver, and gold, and includes both leather and stainless steel straps. The dimensions are nearly identical to the Pebble Time, except that it’s 1mm thicker. Pebble is using that extra space to pack in a larger battery that lasts up to 10 days on a single charge, compared to seven days for the standard Pebble Time. Otherwise, the watch is the same as its non-steel counterpart, with a color display, microphone, and new “Timeline” operating system. The Pebble Time Steel is available for pre-order through Kickstarter now, priced at $250 with leather and steel straps included. It’ll start shipping to backers in July—two months after the standard Pebble Time—and will cost $300 once the Kickstarter drive ends. If you’ve already ordered a Pebble Time, don’t cancel; Pebble says you’ll be able to upgrade to Steel without losing your spot in line. Why this matters: Depending on your view, the regular Pebble time is either cheap or sporty. Either way, it’s probably not the kind of watch you want to wear with business attire. 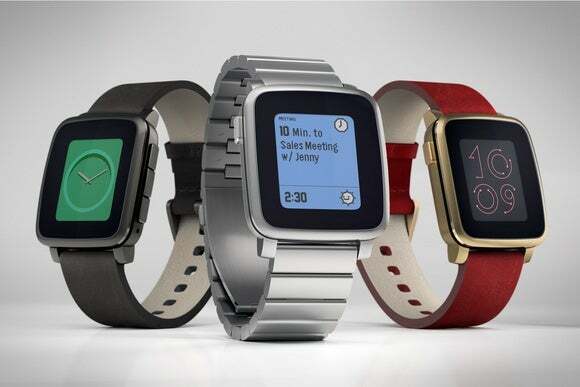 Good on Pebble for announcing the Steel version early, so backers who want a classier version can easily switch. In addition to announcing its Steel smartwatch, Pebble also gave some more detail on how the Time’s new accessory port will work. The company is creating an open platform for “Smartstraps,” letting third parties add features that aren’t available on the watch itself. For instance, an accessory maker could offer a strap with a heart rate monitor, a GPS tracker, or a pollution sensor. A strap could also have its own battery to greatly extend the life of the watch. The idea is that users could swap out straps for different occasions, or replace their straps as better sensors come on the market. 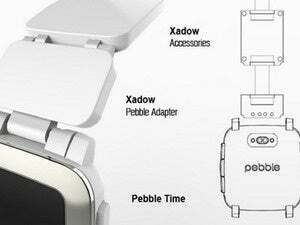 Pebble says the first Smartstraps will launch later this year. While the company hasn’t announced any specific products or partnerships, it’s apparently working with some accessory makers and designers already.